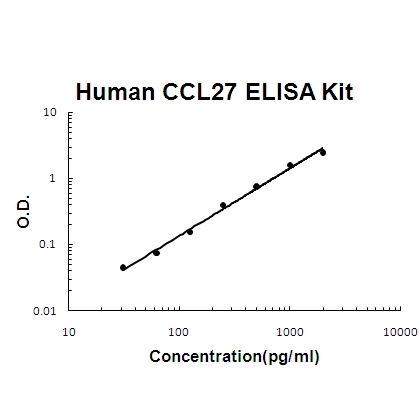 Sandwich High Sensitivity ELISA kit for Quantitative Detection of Human CCL27/CTACK. 96wells/kit, with removable strips. Testis, thymus, placenta, ovary and skin. Chemotactic factor that attracts skin-associated memory T-lymphocytes. May play a role in mediating homing of lymphocytes to cutaneous sites. Binds to CCR10. Chemokine(C-C motif) ligand 27(CCL27) is a small cytokine belonging to the CC chemokine family, it is also known under the names IL-11 R-alpha-locus chemokine(ILC), Skinkine, ESkine and Cutaneous T-cell-attracting chemokine(CTACK). This gene is mapped to 9p13.3. CCL27 is associated with homing of memory T lymphocytes to the skin, and plays a role in T cell-mediatedinflammation of the skin. CCL27 is expressed in numerous tissues, including gonads, thymus, placenta and skin. It elicits its chemotacticeffects by binding to the chemokine receptor CCR10.